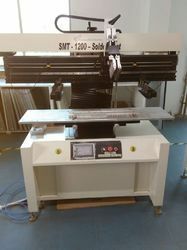 Prominent & Leading Manufacturer from New Delhi, we offer smt semi-auto solder paste printer -1200. Backed by the years of experience in the relevant industry, we are actively engaged in providing a quality approved collection of SMT Semi-Auto Solder Paste Printer -1200to our clients. This range is made under the supervision of best experts, using latest machines and superior quality material procured from the authorized vendors of the market. Moreover, we offer these products in diverse specifications as per the requirements provided by our patrons. We provide these products at market leading prices. Looking for Smt Semi-Auto Solder Paste Printer-1200 supplier ?